WHERE: CHAMPS ELYSEES, PARIS, FRANCE. Bastille Day or “la fete national” (the national celebration) as it is known in France, is the anniversary marking the storming of the Bastille state prison on 14th July 1789. Also, on this day there is a celebration of the “Fete de la federation”, representing the first major event of the French revolution. Celebrations take place all over France, not only on the Saturday but also the days leading up to the national holiday. The storming of the Bastille is treated in much the same way as American Independence Day and/or Canada Day. It is a very patriotic and festive event with a great deal taking place including military parades, communal meals, dances, parties and of course plenty of fireworks. On Saturday, locals and visitors flocked to the Champs Elysees in Paris, lining the streets to get a good spot for the parade. With the president of France starting the parade, thousands of police, firefighters, service men and women from various units, cadets from military schools, the French navy and even the French foreign legion put on a unique and mesmerising display; known to be the largest and oldest military parade in Europe. Not only was there action on the ground but also in the air. The Alpha Jets of Patrouille de France also put on a fantastic aerial display in both aeroplanes and helicopters, spraying smoke from the back of the engines in the “tri-colour” colours of red, white and blue matching the attire of all the locals. After the parade everyone heads of for a celebratory meal or picnic with family and friends or attending the huge free concert that the city Of Paris provides eagerly waiting for the evening’s festivities. The fireworks display was the City’s only firework show of the year on the Champ De Mars at the base of the Eiffel Tower. Boats were filled to the brim and dotted all along the river Seine, crowds start to gather along the Seine and at the plaza at Trocadero across the river all trying to get a good spot for the fireworks display. 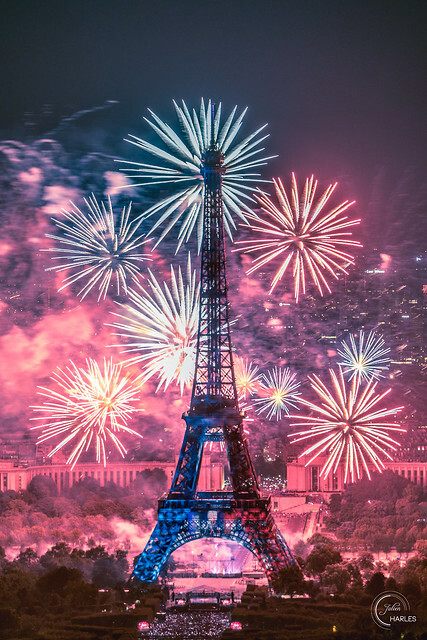 Around 11pm and with the Eiffel tower in the forefront, the massive pro musical display began, as silence fell amongst the crowd in complete awe of the fireworks. With lasers and lights on the tower the whole display lasted around 35 minutes undisturbed.